By Really? All the names taken? Can’t skip lame tutorial. There is no map. Hint just points at things, but doesn’t tell you why. I’m very, very annoyed by this game, especially since this developer sometimes produces good quality games. My clue on how bad this was should have been that you can’t play it before purchasing. Don’t buy this game. 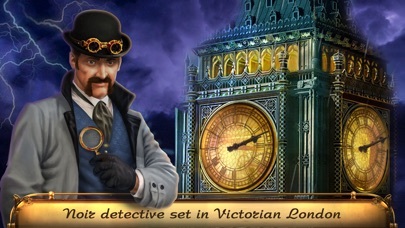 This murder mystery takes place during the 1860s Victorian era and fuses together elements of the Industrialized Revolution in Europe with fictional Steam punk-oriented technological inventions — such as animated robotic creatures, thus adding a sci-fi edge — as well as incorporates traces of the supernatural. 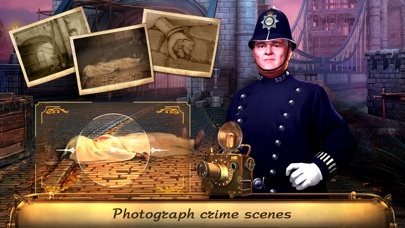 The explorational aspect focuses on suspenseful elements and gritty realism, as you play a detective investigating a grisly murder in London. The storyline is well evolved, delivering surprising twists along the way as you uncover corruption — such as deception and conspiracies — within the society. The settings fit the period, including the architectural style of the buildings. The cartoonish characters are dressed appropriately to suit their profession within the 19th century. The variations of mechanical robots enhance the Steam Punk-themed environment, as they perform productive tasks that a human would normally do — such as the large robot in the bar, with extended arms, signing tickets at breakneck speed. You will constantly refer to your well-detailed all-in-one Diary, which records your tasks, story progression, and information on the various characters you meet as well as collected evidence. 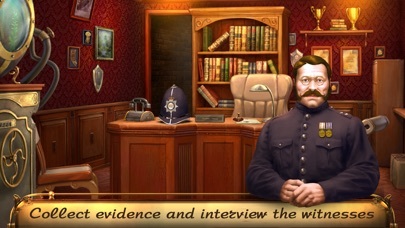 You also analyze evidence using a forensics device, which brings up a repetitive mini game. Custom mode is available to configure settings suitable to your tastes. 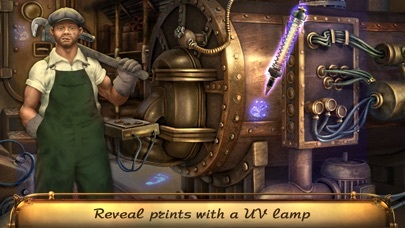 You are given a tutorial at the beginning of the game, which is beneficial to players who are unfamiliar with this developer's style of mechanics. The teleport map — which is acquired a bit into the game — will, most of the time, indicate where there is something to do. However, sometimes the map mistakenly indicated that there was something to do in a particular location, when, in fact, there was not — until you first collected an item within another location. This is not a hand-holding game. 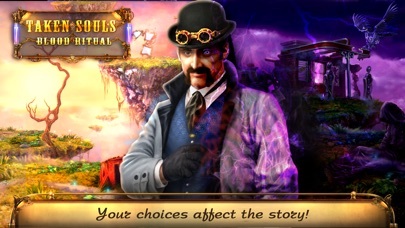 The adventure portion of gameplay requires some patience and thought as to where to go next. Part of the reason is because sometimes the interactive close-ups do not have textual hints, and there is nothing to interact with, thus leaving me wondering if there is either a programming flaw on the developer's part or if I will later return to complete a future task. The directional arrows guide you between locations; you might not be able to leave a particular location until you complete the tasks relative to that location. You also need to swipe all the way over to the ends of both sides of the screen to avoid missing interactive areas or unexplored locations. The arrangements of the HOSs are uniform throughout the game — one singular type. I would have liked some diversity. 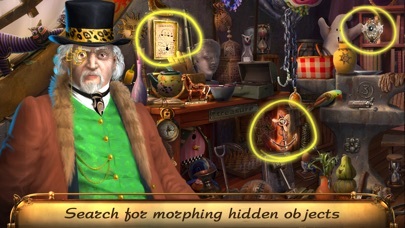 Some of the puzzles are cleverly tied into the storyline. None are difficult to solve, but this does not diminish their entertaining value. 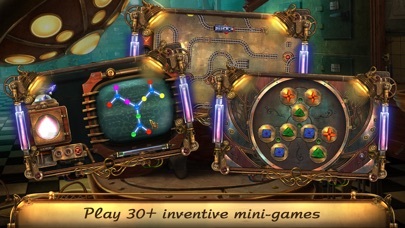 Keep in mind that some of the puzzles are wider than a device’s display can fit; therefore, you will sometimes have to scroll over to both sides of the display to view portions of certain puzzles. You find fingerprints throughout the locations to upgrade the gimmicks' abilities. There are some hiccups: The written dialogue very often does not match the verbal speech. Furthermore, I often have to collapse the inventory bar to access lower lying items and interactive areas, as well as to be able to click on the directional arrows to return to a prior location. Moreover, the mechanics are slightly clunky; however, it does not hinder my progression. In addition, the maze puzzle towards the end of the main game was erroneously programmed. The left side of the maze was almost completely cut off from view — I did scroll all the way over to both sides, but it didn't make a difference — but I was still able to make my way out. Finally, upon conclusion of the game, I checked my achievements, only to be met with disappointment. I did not collect all of the records — I assume on the case — which is an integral part of the development of the storyline; this should have been a mandatory feat. Also, the game finished before I had pinned the last few pieces of evidence on the Evidence Board (EB), thus denying me the satisfaction of concluding the case via deductive reasoning. I am shocked that a game would be programmed to end that way; it makes the inclusion of the EB seem bottomless. Be aware that choices you make along the way do affect certain outcomes. In closing, I feel as though I got my money's worth due to the long playtime; however, this is an exhaustive, time-consuming game. I deducted two (2) stars to account for the aforementioned issues, but overall I enjoyed playing this game. Haven’t finished the game yet, and may not as it is mediocre at best. A serious difficulty is the disconnect between written dialogue and spoken words. It also lacks a map, and some of the inventory items are unlabeled. If I get desperate I may go back to playing, but my recommendation is a pass on this one. Definitely not worth the price. Great to see a new game from Absolutist! A long time waiting! I check weekly as you’ve been a nice alternative to big fish games but it’s been several months since you’ve added a game of this type. Thank you kindly! 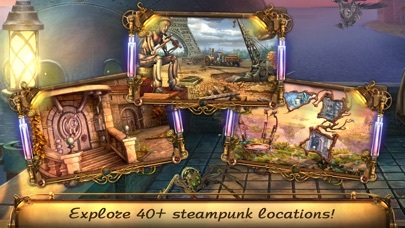 I love the puzzle adventure games with ho scenes added here and there but not the straight ho games so much. They’re a dime a dozen and boring. This was a perfect mix of adventure, puzzles, ho scenes with a who done it story line! I really enjoyed this! There were some glitches such as some mini games did not respond and better directions needed on some but a good mix of easy and more difficult. The ho scenes were nice, also not easy but not overly difficult. They were all of the morphing object and straight forward finds so maybe more variation in your next installment? Graphics were excellent! Transporting map marked clearly. It was sometimes difficult to know what was expected. At times there was no instruction or dialog when opening a window leaving me to guess at possible solutions. Maybe that was the intent? It was usually something that was not ready to be solved yet but could be later in the game. Overall I was very entertained and drawn back to this game any opportunity I could find in my day. Finished in 2 days but the game length was long! A great buy! I highly recommend it! Thank you Absolutist and I truly hope you start adding this genre game more often again! Great job!